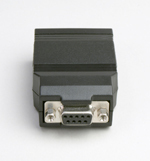 RS232 to USB Keyboard converter. The 725 converter is used to connect RS232 devices direcly to a USB port on a PC, acting as a keyboard. Transmitted RS232 data from the device is entered into the PC screen as if you had typed it in. Barcode, Magstripe, and Proximity readers with RS232 outputs can now be directly connected to a PC without the need for a serial port, or usb-to-serial converter. Connect your scanner or reader directly to the 725 and all data is entered directly into the PC (like a keyboard). No drivers are required on the PC.